A picture is worth oh, so many words. President Donald Trump held his second State of the Union address on Tuesday, February 5. Due to the longest government shutdown on record, the original date was bumped back by House Speaker Nancy Pelosi. 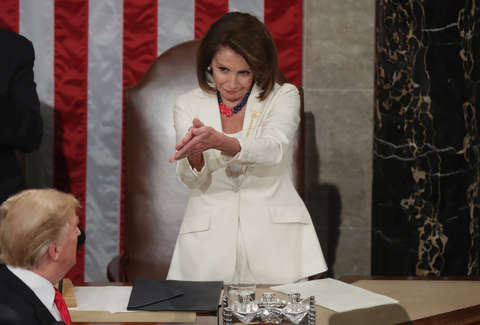 Trump was undoubtedly the main attraction of the State of the Union, but he was delivering the address in the home of Pelosi, who sat just over the President's left shoulder. Eyes were glued to her as she delivered a real-time feel for how the Democrats might respond to Trump's agenda. Here's the moment in context. Though the clap looked sarcastic, the intention behind her clap is unknown. Nonetheless, it makes for a striking image that more than a few people have found to be meme-worthy.